This is the first game in the Mortal Kombat series. For other games in the series see the Mortal Kombat category. For the 2011 release on Xbox 360 and PlayStation 3, see Mortal Kombat (2011). 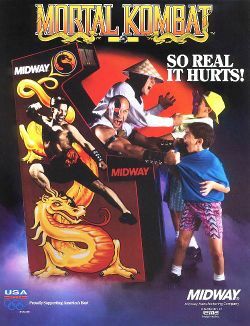 Mortal Kombat is an infamous arcade game that was a developed by Midway in response to Capcom's successful Street Fighter II. It used a different kind of fighting system from Street Fighter's formula; the buttons were laid out in an "X" pattern with high punch, low punch, high kick, low kick, and block buttons along with an eight-way joystick. The game also introduced the concept of juggles, or the ability to attack the opponent while he or she is still in mid-air. One of the most famous (and notorious) features was the fatality, a finishing move executed on a defeated opponent in a gruesome fashion. The game features seven playable characters, all of whom are unique in their own way, with different special moves and fighting styles. Unlike Street Fighter II, each fighter shares a common pool of regular moves (e.g. down and high punch performs an uppercut for every character.) Once the player chooses a character, he or she must face seven other combatants (including yourself) until they reach three endurance matches (which is a handicap match, or two against one) and the two bosses (a sub-boss named Goro and the final boss: Shang Tsung). This page was last edited on 30 May 2016, at 13:26.